November is apparently sweet potato awareness month. What it is we’re supposed to be becoming more aware of exactly, the sweet potato powers that be haven’t disclosed. For anyone who is completely unaware, sweet potato is a food cousin of potato and comes in three varieties (that I know of) with a white, orange or purple flesh. You store it the same way you would any other root vegetable, somewhere cool. I’ve always had sweet potato in my diet as it’s a staple in most Caribbean cooking. It’s a part of what we, Jamaicans, call ‘hard food’. Hear Rasheada and I explain this in the Table For Two podcast here. You can roast it, boil it, fry it, blend it, mash it, hash it, grate it for baking, and most recently toast it – but I’m not convinced on this one. This sweet potato awareness month I’ve decided to become more aware of recipes with sweet potato that aren’t just plain potato mashed or fried, starting with this sweet potato, carrot and squash soup. The loveable thing about most soups is that there isn’t an exact art to them, and if you find yourself lacking in one ingredient but can make up the weight in another then please, go for it. I have another sweet potato soup recipe here, where I used my hand blender to produce a perfectly smooth and creamy texture. However here, I opted for a chunkier soup and used my potato masher to go through the soup by hand until it was the texture I desired. You’ll need a chopping board, a knife, medium pan, and a glass measuring jug. 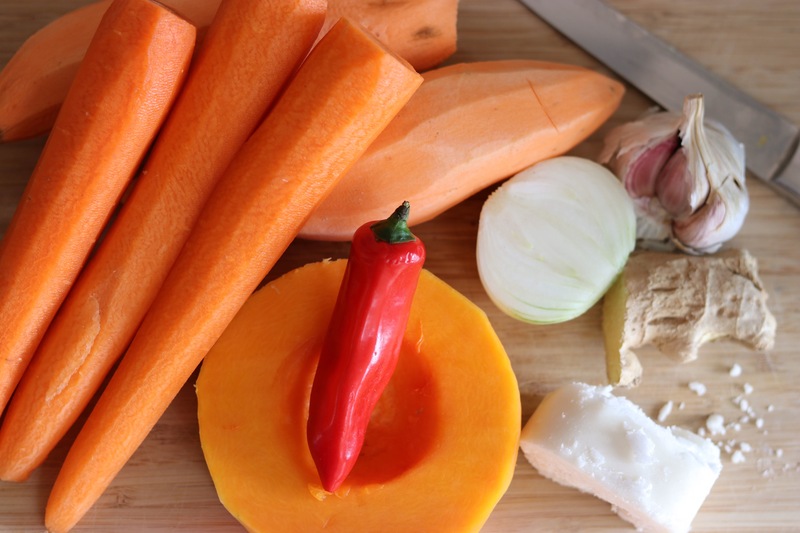 Cooking prep: slice your onion, and cut the sweet potato, carrots and squash into equal chunks. If you are making your own coconut milk then put the kettle on too. Heat the toasted sesame oil over a low-medium heat, then add the sliced onion, garlic and ginger. Stir periodically until the onions are almost translucent. Add all of your carrot, squash and potato chunks and coat with onion mix. Pour in your 400ml can of coconut milk. In a glass measuring jug place 100g pure creamed coconut and fill with 400ml boiling hot water. Allow 2 minutes to begin dissolving, then mix until the coconut is completely broken down. Pour over the potato mix. Heat until simmering then add a further 800ml hot water. Bring to the boil, then lower heat to a vigorous simmer. Allow 15-20 minutes, depending on the size of your food pieces, until a fork can pierce the squash with ease. If you’re going for an entire smoothly food blend, boil for a further few minutes until the potato begins to break in the water before blending. If not, get to mashing! Garnish with coriander and some pumpkin seeds if you like. Store any leftovers in microwave safe containers so you can warm it later with ease!